Ireland vs Afghanistan Highlights Super Sixes: Afghanistan qualified for the 2019 cricket World Cup after beating Ireland by five wickets. 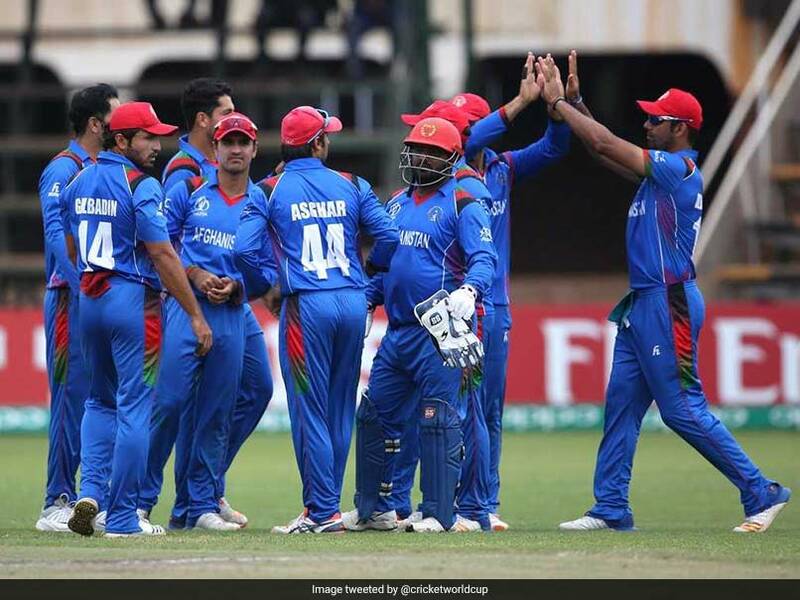 Afghanistan, after losing their opening three qualifying games, upset the odds to beat Ireland by five wickets on Friday to qualify for next year's Cricket World Cup. Asghar Stanikzai, coming back from a bout of appendicitis, hit an invaluable 39 not out off 29 balls to guide the Afghans to 213 for five in reply to Ireland's 209-7. Afghanistan will join fellow qualifiers West Indies in the 10-team World Cup to be staged in England and Wales from May 30-July 14, 2019, alongside defending champions Australia, India, Pakistan, Sri Lanka, Bangladesh, England, South Africa and New Zealand. Highlights: Ireland vs Afghanistan, World Cup Qualifiers 2018, straight from Harare. Afghanistan join the West Indies for the 2019 World Cup. 20:15 IST: Afghanistan beat Ireland by 5 wickets. After 40 overs, Afghanistan are 151/4. 19:30 IST: 150 is up for Afghanistan in the 40th over. They need 59 runs in 10 overs to make it to the 2019 ICC Cricket World Cup. 18:15 IST: 100 up for Afghanistan in the 22nd over and now they need 110 more runs to secure a place in the 2019 ICC World Cup. After 22 overs, Afghanistan are 100/1. 17:45 IST: 15 overs gone and Ireland are yet to take a wicket while Afghanistan openers are still going strong. After 15 overs, Afghanistan are 69/0. 17:20 IST: Afghanistan are off to a brilliant start in their pursuit of 210 as Mohammad Shahzad and Gulbadin Naib are scoring at a swift pace and have managed to keep the wickets intact. After 8 overs, Afghanistan are 39/0. 16:20 IST: Kevin O Brien's late flourish helps Ireland post a fighting total of 209/7 in 50 overs. Afghanistan need 210 runs to qualify for the 2019 ICC World Cup and face the West Indies in the Qualifiers' final on Sunday. After 40 overs, Ireland are 143/4. 15:30 IST: Ireland have failed to capitalize on the good start provided by the top-order as they are struggling to accelerate the scoring rate. On the other hand, Afghanistan bowlers have pulled back things brilliantly. What an unfortunate way to get out after such a splendid knock. After 32 overs, Ireland are 121/2. 14:55 IST: 50 up for Paul Stirling and 100 up for Ireland. Niall O Brien, on the other end is going after Afghanistan bowlers to accelerate the scoring rate. After 25 overs, Ireland are 79/2. 14:30 IST: 50 up for Ireland in the 14 over. And Rashid Khan banks on his leg break. 13:50 IST: 50 up for Ireland in the 14 over. After 16 overs, Ireland are 56/1. 13:40 IST: William Porterfield and Paul Stirling have provided a solid start to Ireland against the usually menacing Afghanistan bowlers. Although the bowlers are not leaking runs per se, they are not being able to take wickets as well. After 10 overs, Ireland are 37/0. 13:20 IST: Overhead conditions are overcast so there might be some movement with the new ball but the first 5 overs have belonged to Ireland, who might not have scored a lot of runs but are trying to build a solid platform for a competitive total early on. The same pitch that was used for West Indies vs Zimbabwe is being used for this match. This is the best pitch of the tournament so far. After 5 overs, Ireland are 15/0. 13:01 IST: Ireland have won the toss and elected to bat. 13:00 IST: Welcome to the live blog of the final Super Six match between Ireland and Afghanistan. The winner will face the West Indies in the final of the tournament. Thursday’s result means the winner of Friday’s match will become the second qualifiers after the Windies to qualify for the ICC Cricket World Cup 2019 and will also feature in Sunday’s final. Apart from the significance of this match, it will be Niall O’Brien’s 100th ODI while Rashid Khan will be looking to claim four wickets to become the quickest bowler to 100 wickets. The only way Zimbabwe can qualify for the World Cup is in the scenario of a tie (in which each side bats for, at least, 25 overs). In this situation, Ireland’s net run-rate will drop behind Zimbabwe.